Sliding scale fees are variable prices for products, services, or taxes based on a customer's ability to pay. Such fees are thereby reduced for those who have lower incomes, or alternatively, less money to spare after their personal expenses, regardless of income. Sliding scale fees are a form of price discrimination or differential pricing. Once you are quite clear on what your scale is, put it in writing and offer it to every patient, without exception and without asking for proof that they deserve it. "Sliding scale available upon request" makes patients feel they have to grovel for your charity. "Individuals or families who are unable to pay the full fee for a General membership or Family General membership due to financial circumstances may apply. 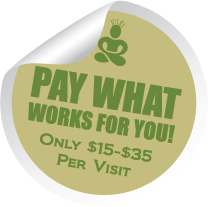 All members are expected to pay a portion of the monthly fee, typically a minimum of 50%. We assess everyone individually and will discuss all of your options during your interview."